I’ve had Nootropics Expert readers asking me what my preferred multivitamin/mineral supplement is. And what I use every day. This post is a detailed response to that question. 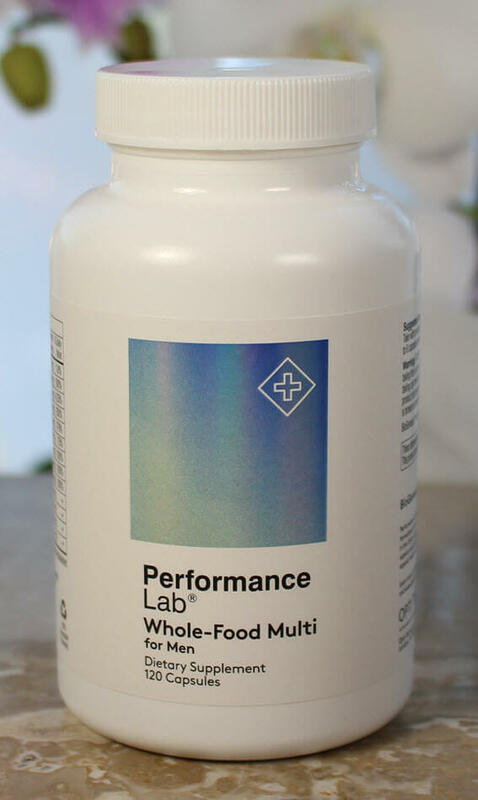 Performance Lab® Whole-Food Multi is by far the best multivitamin/mineral supplement I’ve used. And I’ve tried several different brands of multivitamins over the last 10 years. Including a couple of the well-known raw- and whole-food multivitamins available at the local vitamin shop, Whole Foods and online. But the question I often see goes something like, “is a multivitamin necessary”? Even if you are living a much healthier lifestyle like I have since being diagnosed Adult ADD 10 years ago. And even more so since turning hypothyroid 5 years later. 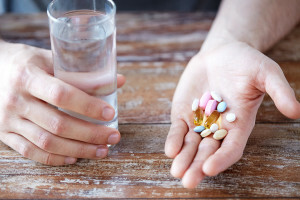 Does this picture of health really need to take vitamins? Unfortunately, the answer is, “Yes”. 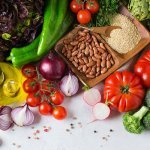 The thing is, even if you meet the Recommended Daily Intake (RDI) for servings of fruits and vegetables, it is impossible to get the nutrients your body and brain need for optimal health. Our fruit, vegetable and meat products simply do not have enough vitamins and minerals to naturally support a healthy body. Grown on nutrient-depleted soil. And most have been genetically modified to grow faster. GMO produce grows so fast it hasn’t time to draw in enough nutrients from the nutrient-starved soil it’s grown on. Then the nutrients that do make it into our food are lost during transport, storage, processing, and cooking. The obvious, simple answer is give your body what it’s been deprived of by using a multivitamin/mineral supplement. But not all multivitamin supplements are created equal. In fact, most of what you’ll find on supermarket, drugstore, and even vitamin shop shelves are useless. Some are actually toxic and dangerous to use. In this post I’ll share the criteria I use to select a multivitamin, the supplement I prefer and use every day, ingredients needed for optimal health, how they work together, cost, and where to get it. One of the things people do when first becoming health-conscious is to start using a daily multivitamin. And if you are anything like I was when first getting started, you look on in confusion at shelf after shelf with hundreds of multivitamin supplements to choose from. Instinct is to grab the first multivitamin you recognize from the slick commercials on TV. You take the multi for a month and don’t feel anything. No better than you did before. What’s going on? First, we need to take a close look at the label. A multivitamin bottle label will tell us all we need to know. If you know how to read it. And understand what’s in the bottle. What I’ve learned since my first multivitamin purchase is most of them should have a “Black Box” warning label. The kind the FDA mandates pharmaceuticals put on some of their drugs. Here’s a quick summary of what I look for, and what to avoid. Near the bottom of the ingredients label, if you see FD&C Blue No. 1, FD&C Green No. 3, FD&C Red No. 40, or any of their variants, put the bottle back on the shelf. These abbreviations represent food dyes made from petroleum and have been used in food and supplements for decades. But why would you need artificial colors in your multivitamin? Recent studies link food coloring to hyperactivity in kids. [v] And European lawmakers now require a warning label on foods that contain artificial dyes. Another one you’ll see is hydrogenated fats like ‘soybean oil’. Used as a filler to bulk up the tablet or capsule. Yum. Exactly what you don’t want in your multivitamin. Next, look for talc, or magnesium silicate. Talc is a mineral composed of magnesium silicate, silicon, oxygen and hydrogen. And used as an anti-caking agent and cheap filler in multivitamins. 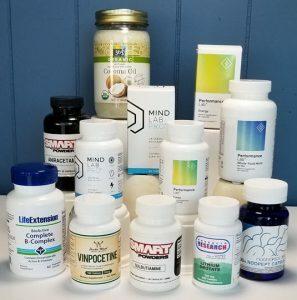 If you want to learn more about what to avoid and what to look for, please see my post, “How to Select the Best Multivitamin for Brain Function”. This category covers a whole host of problems with most multivitamin supplements. Our bodies were designed to get vitamins and minerals from food. But most multivitamin supplements on the market today are synthetic. Vitamins created using coal tar derivatives. And minerals using ground up rock. 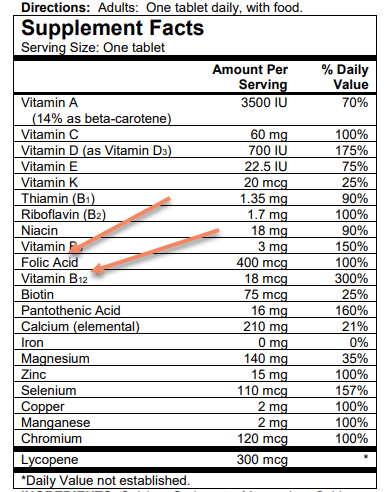 I’ve found one of the quickest and simplest ways to assess a multivitamin for quality and “food-based” is to look for Vitamin B9 (folic acid) or Vitamin B12 (cyanocobalamin); neither of which is food-based. If either one is on the label then the entire bottle must be avoided because the rest of the bottle is unlikely to be a quality, food-based vitamin complex. For more on avoiding “USP Vitamins, Pharmaceutical Grade and Natural” in your multivitamin, see my post here. 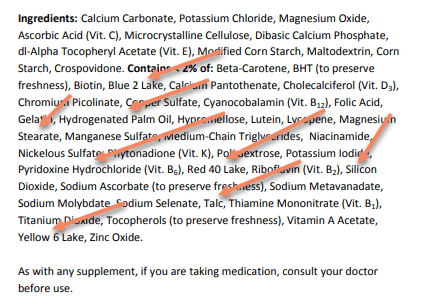 One of the things that really irks me is manufacturers who use a “Proprietary Formula” in their supplement. Proprietary formulas hide how much of an ingredient is in the bottle. Which is a problem because I want to know exactly how much of each ingredient I’m getting in a tablet or capsule. I need to know if I must add extra of one vitamin or mineral based on my unique body chemistry and health issues. And proprietary formulas are also a sneaky way of including what I call a “fairy dusting” of an ingredient. An amount so small it only looks good on the label. And does nothing for optimizing your health. Now that we’ve established what we want to avoid in a multivitamin supplement – what’s left? It turns out there are very few raw-food and whole-food supplement makers who produce a high-quality multivitamin. I’ve tried some of them, and they are good. These whole-food multivitamins contain the right form and dose of each vitamin and mineral. But all of them add unnecessary ingredients. A blend of organic food powders to make it look more like a “whole-food” multi. Or a little CoQ10 in a form which my body cannot use. Or a proteolytic blend of enzymes that is supposed to help clear fibrin. But instead digests my food if I take it with a meal. All I want is a simple, pure, whole-food multivitamin that supplies only the vitamins and minerals my body and brain need every day. Only one company on the entire planet produces a simple, pure multivitamin. Performance Lab® is a new line of supplements made by Opti Nutra Advanced Nutraceuticals. The same people who produce Mind Lab Pro®. Performance Lab® Whole-Food Multivitamin is the foundation of their new supplement line. Performance Lab uses ‘nature-identical’ vitamins and minerals which include their natural cofactors to ensure their bioavailability. And your body can use them. Unlike isolated vitamins and minerals found in most other multivitamins, these nutrients go straight into the cells and tissues where they are needed. The company uses their own proprietary BioGenesis™ method to grow whole-food based nutrients. Avoiding genetically-modified organisms (GMOs), pesticides, herbicides, and other toxins. The only ingredients in this Performance Lab Multivitamin are the vitamins and minerals listed on the label in their purest, bio-identical form. In dosages designed to support and enhance a healthy body and brain. The company uses Plantcaps® vegan capsules made from tapioca instead of the semi-synthetic polymer found in other vegetarian capsules. And infuse the capsules with a prebiotic for better digestion and boost the bioavailability of the nutrients in this Multi. 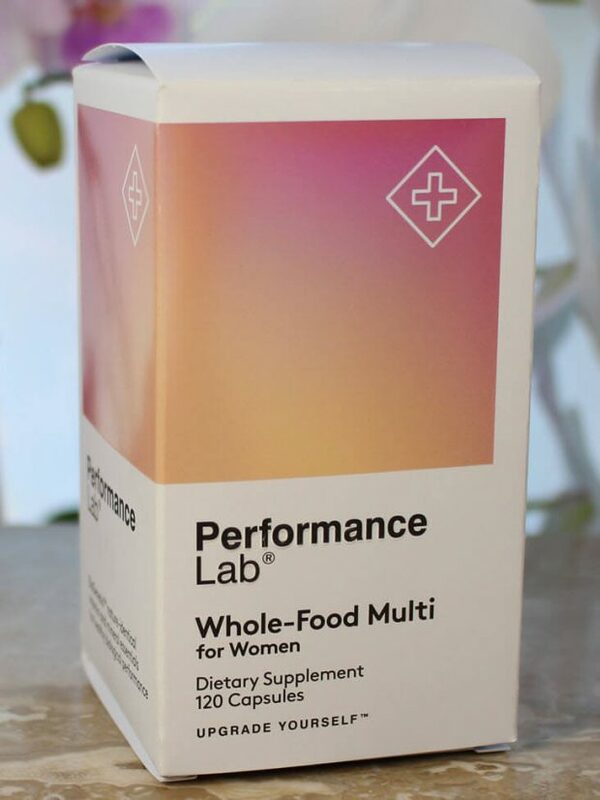 The Performance Lab Multi is available for men and women with only slight differences in their formulas. The women’s multi contains iron and double the amount of Vitamin B9 (folate) compared to the men’s formula which has a little more boron and zinc. Here’s a full list of the vitamins and minerals in Performance Lab’s Multi with a summary of what each does in your body and brain. Every vitamin and mineral in this multivitamin is as important for your brain as the rest of your body. 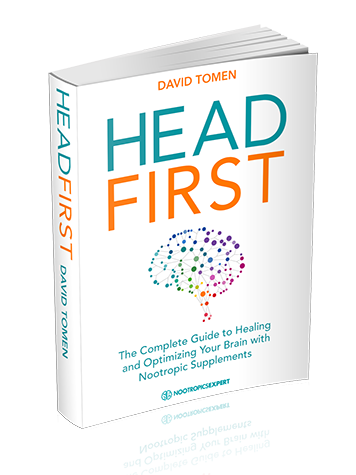 So the emphasis in descriptions are for brain health and optimization since that is our focus here at Nootropics Expert. For more detail on how each vitamin is critical for brain health, see “13 Vitamins Essential for the Optimized Brain”. 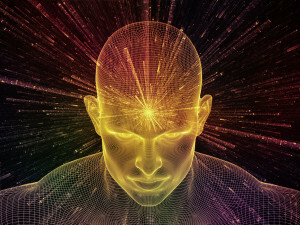 For more detail on how each mineral is critical for brain health, see “13 Minerals Essential for the Optimized Brain”. In a perfect world you get all the nutrients your body and brain need from the food you eat every day. But we don’t and for reasons covered earlier in this post. So we try to make up for this deficiency with a multivitamin supplement. The problem is most minerals and vitamins used in multivitamin supplement formulas do not contain protein chaperones or other cofactors needed for absorption into your cells. The form of vitamins and minerals you get from real food. Most other supplement companies, with very few exceptions, use “isolated” minerals and vitamins made from petroleum derivatives. Forms of nutrients your body does not recognize as nutrients. Your body either expels them as unwanted toxins, or these impostors attach to receptors required by genuine vitamins and minerals for various actions in your body. Using BioGenesis to produce vitamins and minerals avoids this toxicity. And provides nutrients in the same form you would normally get from food. The amount of each ingredient listed on the label is for Performance Lab’s recommended 4-capsules per day. I recommended using 2-capsules in the morning and the other 2-capsules mid-day. Some of the ingredients in this multivitamin are fat-soluble so take each 2-capsule dose with a meal containing healthy fats. Or a tablespoon of unrefined coconut or MCT oil. It is safe to dose up to but no more than 6-capsules per day. While BioGenesis nutrients are highly bioavailable and non-toxic, some nutrients like Vitamin A and Vitamin E are stored in fat in your body. And not expelled in urine like water-soluble nutrients. Dosing more than your body can use daily may cause an unnatural buildup of some vitamins and minerals. Eventually leading to possible toxic overload and health problems. Check the label of Performance Lab’s Multi and you may notice some nutrients dosed lower than some other brand of multivitamins. You’ll also notice some nutrients dosed at exactly the Recommended Daily Intake (RDI). But some a little higher or lower than the RDI. Opti Nutra calculated these dosages based on synergy and how each nutrient supports and work with others in this formula. Performance Lab ingredients work in harmony with each other. And with your body’s ability to naturally produce certain proteins, enzymes, amino acids, hormones, and neurotransmitters. The intent is not to upset the balance and artificially boost specific areas of your body with this multivitamin. Rather the intent is to ensure your body and brain get optimal amounts of each vitamin and mineral it requires to thrive every day. I love this multivitamin. Two capsules in the morning with a tablespoon of unrefined coconut oil along with the rest of my nootropic stack. And it launches my day. I take another two capsules at noon with unrefined coconut oil and my nootropic stack. And I’m productive for the rest of the day. I’ve noticed a difference since I replaced my previous multivitamin with the Performance Lab Multi for Men. It feels cleaner, productivity has increased a little more, mood is slightly better, and I sleep better. One of the things I’ve learned over the years of working with nootropics is it’s not cheap. In fact, taking each nootropic, vitamin, and mineral on its own in my case can add up to hundreds of dollars per month. But I’m OK with this investment in my health. Because it has completely changed my life for the better. In this case, I know my body and brain demand a multivitamin/mineral supplement daily. I’ve searched long and hard for the best multivitamin I could find based on what I’ve learned over the last few years. Now it’s no surprise that the highest quality supplements are often more expensive. But I’ve also found that when compared to buying many of these ingredients as separate supplements, it turns out to be a whole lot less. In my case, I’m no longer using a separate B-Complex supplement, or a separate zinc or selenium supplement. 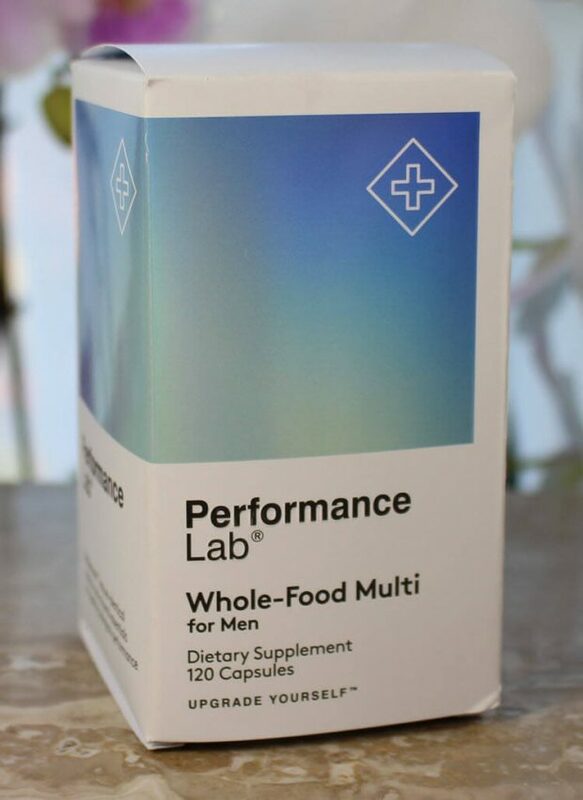 This Performance Lab Whole-Food Multi for Men is a little more than my previous whole-food multivitamin supplement. But I’ve cut down on 3 other separate supplements in my stack, so it comes out to about the same investment in my health. 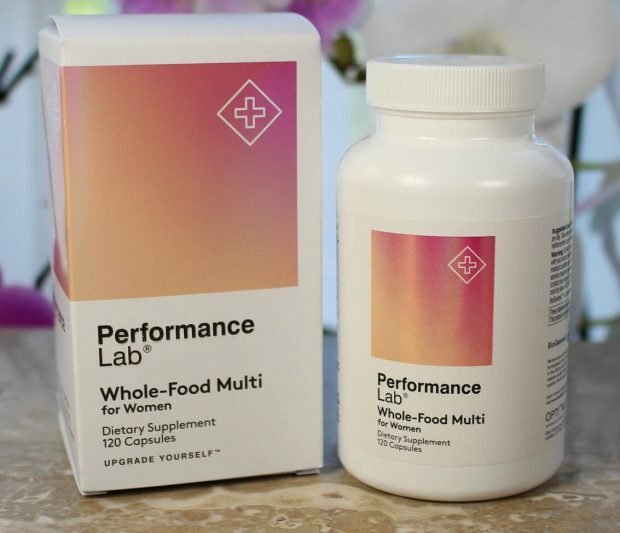 Performance Lab Whole-Food Multi for men or women is only $40.00 for a 1-month supply (120 capsules) (+ shipping & handling). And when you get 2 boxes of this Multi you earn a 5% discount. Or a 10% discount when you get 3 boxes. Opti Nutra has taken an extra step to include Plantcaps® instead of regular vegetarian capsules in their stack. These vegan caps are made from tapioca. And each capsule is infused with a Prebiotic for better digestion and bioavailability of the whole multivitamin/mineral complex. All of the other competitors with a high-quality multivitamin use HPMC vegetarian capsules which are a semi-synthetic polymer made from wood pulp. 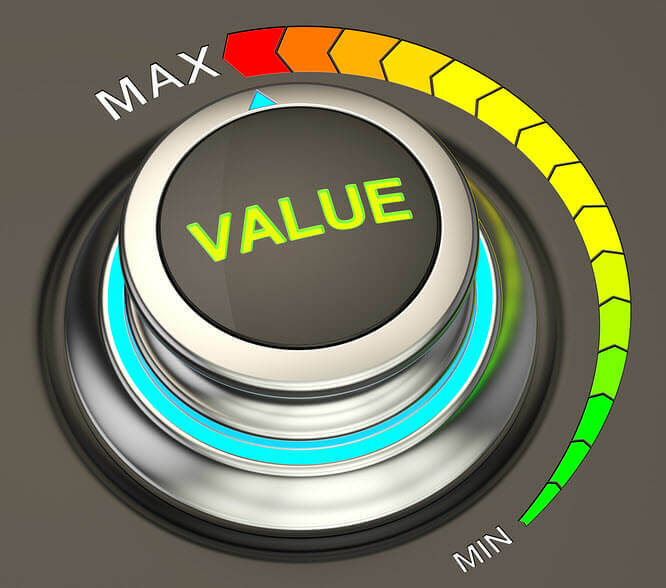 Now, let’s look at what I think are the pros and cons of this premium multivitamin. 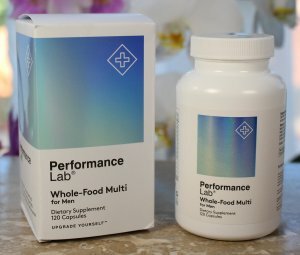 In all, the nature-identical ingredients and dosages included in the Performance Lab Whole-Food Multi are perfect for a multivitamin. Magnesium is too low and most of us are deficient in this critical nutrient. But once again Opti Nutra has thought of everything in this formula. Because the magnesium that’s ‘missing’ in the multivitamin is in the Performance Lab Sleep formula. Which is when you should be taking your magnesium dose anyway. Most important is Opti Nutra fully discloses how much of each ingredient is in each 4-capsule dose. 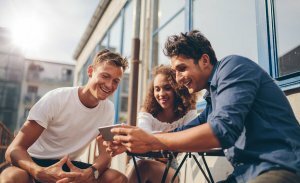 So you know exactly what you need to add for your unique health issues. I recommend the use of the Performance Lab™ Whole-Food Multi for men and women as a daily multivitamin to support your biohacking and brain optimization goals. Pricing of the Performance Lab Whole-Food Multi is competitive for what you get. But I realize some will express disappointment that Opti Nutra only sells this multivitamin from the Performance Lab website. I’ve been in internet and direct marketing for many years and completely understand the challenges of putting new products into retail stores. Especially worldwide. The goods news is Opti Nutra offers a risk-free, “empty bottle”, money-back guarantee. Opti Nutra also decided not to offer Performance Lab Whole-Food Multi on Amazon.com because they don’t want this multivitamin to appear alongside low-quality junk products. And I get that. Amazon can also be a place where reviews are easily manipulated by jealous competitors. And the thing is anyone looking to understand the methodology that went into developing this multivitamin, Amazon is not the place for extensive product descriptions. So if you’ve been experimenting with nootropics for a while and are serious about improving your health – I recommend giving Performance Lab Whole-Food Multi a try. This is the best multivitamin I’ve ever used. And this after over 10 years of trying several whole-food multivitamins from various manufacturers. It’s certainly not the cheapest multivitamin on the market. But it’s not unreasonably priced either at only $40 for a month supply. And for me, Opti Nutra has set a higher standard for the entire supplement market by introducing this multivitamin. And the rest of their Performance Lab line of supplements. Product and packaging quality, nature-identical BioGenesis™ vitamins and minerals, Plantcaps®, testing and more testing. Things the average person wouldn’t even notice. But we’re not average! And we demand the best. It has been a few months since we discussed where a health conscious aging man 70+ can purchase a vitamin supplement that the body can use. Based on my experience on using various nootropics and supplements that you have recommend i will be trying a 3 month supply for myself and a 3 month supply for my 55+ wife. I came to the same conclusion as you did a few years ago that the best investment a person can make is in there health. I come from the position that the best way to prevent illness is to create the environment where health proliferates. Is this multivitamin really worth the cost? Compared to Naturelo multivitamin, this product is double the cost. Meanwhile, they essentially have the same exact ingredients baring few. Is double the cost really worth B5, B7, strontium, inositol,vanadium, and boron? Charles, last I checked the ‘comparable’ Naturelo Whole-Food Multi for men retails for $44.95. I’m sure you can find it cheaper elsewhere. But the bottom-line is how it makes you feel. 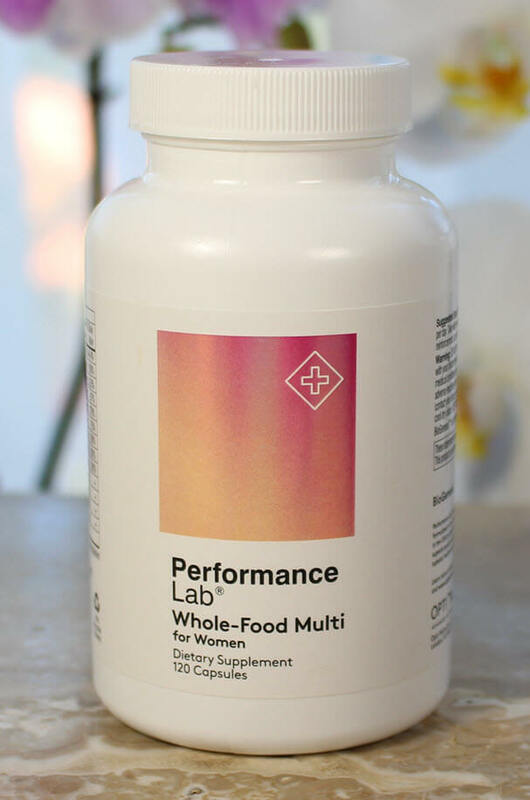 The Performance Lab Whole-Food Multi is the first multivitamin I’ve tried where I can actually “feel” the difference. But that’s just me… You’d have to try it to find out if it’s worth it. Charles, Naturello puts out a good product without question. In this case I don’t think it’s a fair comparison however but let’s not debate the details. The one thing that has always irked me about products like this is why do manufacturers insist on including a ‘fairy dusting’ of “Organic Fruit and Vegetable Blend”. It’s useless and takes up space in the capsule. The only thing I can think of why they would do this is marketing. Which makes me a little suspect of the rest of their formula. I am juicing cucumber, celery, spinach, lacinato kale, pineapple and carrots 5 days a week. I take a multi, but it is probably one of the ones you mentioned that are not very good for me. I am also taking a B12 supplement and a C supplement in addition. Both are quality products. I am also working into uridine + Alpha GPC + DHA, but the uridine does not do much more than make me sleepy. I have broken open the 300mg pills and take 50 mg of uridine – I was taking it in the morning, but I have changed it to night time. Today is the first day with Alpha GPC, but I only took 75 (ish) mg and so far the jury is still out. In your opinion will the multi vitamin from Performance Lab help? Gordon, it all depends on what you are trying to achieve. If Uridine doesn’t agree with you then delete it from your stack. And to see the benefit of Alpha GPC, you’ll need at least 300 mg. 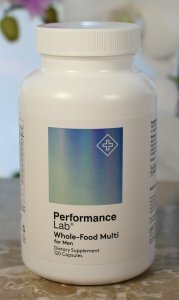 I can only suggest you try the Performance Lab Whole-Food Multi and see if it makes a difference. I wasn’t kidding when I said I could “feel” the difference. I realize each of us is different in our genetic makeup and a host of other ways. But one common factor is we require everyone of these vitamins and minerals no matter how we get them. The only way to be sure we’re getting them is with a Multi like this one. Let me know what your biohacking goals are and I may be able to make some other suggestions. Do you think it is a good idea to use performance lab whole-food with performance lab mind and Lab Mind pro. Could It cause any unwanted effect? Santiago, using Performance Lab Mind along with Mind Lab Pro means you are doubling your dose of Citicoline, PS, NALT and Pine Bark Extract. But by no means to dangerous levels. That combo with Performance Lab Whole-Food Multi could produce great results for you. I use the same combination but use Performance Lab Energy instead of Mind and it works well for me. It just depends on your biohacking goals. your advice is surely very welcome and well substantiated. I understand that it is impossible to try and test all, but may you check two full spec’ed combo products (multi vits/mins) that I used to use for a while. 2.) Youngevity ‘Beyond Tangy Tangerine 2.0’ + ‘Pollen Burst Plus’. Do you think that Performance Lab line (2-3 products) could replace above two options with benefit ? Sam, I’m not familiar with either of those supplements and haven’t done the research to know how they are made. If you are comparing apples to apples and both are made to the standard that Performance Lab uses to produce their vitamins and minerals then it comes down to which one works best for you. I’ve always been careful about selecting my supplements. And until Performance Lab came along I used Garden of Life Raw-food Multi for men which worked well for me. But I’ve since found that the Performance Lab Whole-Food Multi works even better and I feel better when I use it. I’m taking B-Complex at the moment. And I’m waiting for my delivery of M.L.P. and Performance Lab Whole-Food Multi for men. When I’ll start taking Whole-Food Multi, which has B Vitamins in it, should I still be using B-Complex? Mick, it’s up to you but I find using a high quality B-Complex stack along with MLP and the Performance Lab Multi works for me. Thank you for the great infos you share to help us! I’m impressed with the quality of this multi, and I’m willing to try it (good thing they sell it in Europe!). My main concern regards past experiences with quality multivit/min: last 2 times I used it (2 different brands, first I don’t happen to recall, second was Country Life’s Daily Total One) I’m pretty sure my depression got worse, and stopped it for that reason. May it depend on one ingredient in particular, that you know may happen to negatively influcence mood (copper comes to my mind), or the quantity, or maybe the type of it (eg. I just re-read the label of DTO, it has folic acid instead of folate)? At the time I was taking an SSRI, right now I’m off medications but of course I want to play on the safe side on that regard. Andrea, it’s interesting that you thought a multivitamin may have contributed to your depression. That’s the thing with most multivitamin/mineral supplements. Most are made using synthetic vitamins and ground up rock for minerals. The human body cannot use these chemicals and does its best to expel them. As soon as I see folic acid instead of folate on a multi label I put it back on the shelf. Because if the company is using cheap, synthetic folic acid then what else in the multi is synthetic? This Performance Lab Multi is the best I’ve ever used. I’m interested in learning how your body reacts to it. It should be a very positive experience. What do you mean by ‘That’s the thing with most multivitamin/mineral supplements’? Just to make sure: you don’t seem concerned about any particular element or its quantity in a multi that may in itself tend to worsen mood/depression and I should avoid, provided they are in the right form, is this correct? Andrea, you are correct because in general multivitamins only provide the minimum RDA of each vitamin and mineral. However, you should still closely read labels not only because you want to watch out for and stay away from synthetics. But manufacturers will sometimes add too much of one particular vitamin for a variety of reasons. Like mega-amounts of Vitamin A. But if each vitamin and mineral in the multi is ‘nature-identical’ the nutrients will be taken into cells for use. Rather than expelled as toxic waste. Or stored in fat because it can’t get rid of it right away. A lot of care and research has gone into designing this multivitamin supplement. So it should not cause any type of adverse reaction. If it does, then we need to look deeper into whatever issues you may be dealing with. This multi is surely in my wish list. I may be able to buy it in the near future. If I do, I’ll be happy to report back to you the results. Meanwhile, thank you for your time and wisdom. Joyous holidays and best wishes for 2019! I’m pleased to say that my first bottle of WFM just arrived. Thanks to your extremely useful reviews as well I’m also planning to buy Mind and Energy, eventually on a monthly basis! do you receive a commission for new customers you help decide, and can you offer a discount for them? Either case, please provide a link or a code to me, I’ll be glad to use it! Andrea, I do get a commission for sales of Mind Lab Pro and all Performance Lab Products done through Nootropics Expert. Discount codes have been included in my last few emails. Are you subscribed to Nootropics Expert emails? knowing you will get a commission will double my pleasure in using the discount code. I found it at the bottom of your newsletter, thank you! I am planning to stack CILTEP, Mind Lab Pro, Performance Lab Whole Food, Sulbutiamine, Aniracetam and unrefined coconut oil what do you think of this David? Kyle, sound like a great stack and should work well for you. Let me know after a couple of weeks of your experience. Hello David I bought a whole food multivitamin from natures plus source of life men. Justin, looks like an OK multi but once again one of my pet-peeves – they use a fairy-dusting of some ingredients to make it look good. But at 10 mg dosages are useless. Makes me wonder about the quality of the rest of the product. I would like to know your opinion on pqq.And what would work well for a 60 year old woman looking to gain energy and jump start my metabolism.I believe it has all but stopped lol.thank you. Jessica, PQQ is a good choice but this is not a “one pill” solution. It’s going to take a lot more than just PQQ to jump start things. Your mitochondria are the tiny little power plants in each of your cells. The combination of PQQ and CoQ10 work to fuel mitochondria and even create new mitochondria. I use and recommend (it really does work!) Performance Lab Energy which has both: https://nootropicsexpert.com/performance-lab-energy-review/. But your cells and mitochondria also require all the vitamins and minerals that are in the Multivitamin supplement reviewed above. I suggest trying both and reporting back in a couple of weeks. Let us know how you feel. Then we’ll go from there. Hi David, I am interested in purchasing one of these to try it out, is there a discount provided by you or the seller for first time buyers? 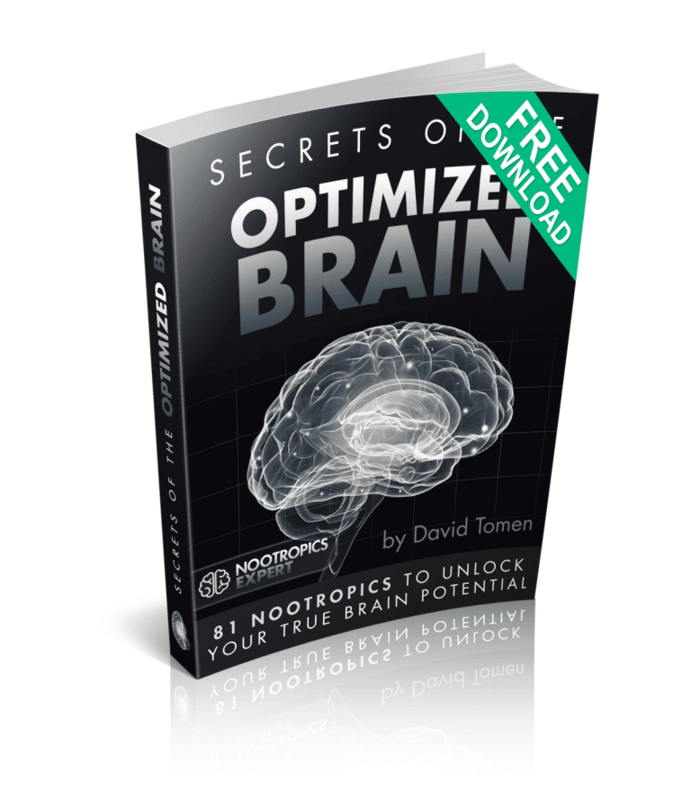 RM, Opti Nutra sometimes provides me with a discount code for Nootropics Expert readers. But the last one I had expired a couple of months ago. Another way to look at this is add up the cost of each stack if you were buying each ingredient separately. It think you’ll find for this quality, that these supplements are reasonably priced even at full price. You are quite right about that, I will order some regardless. Was just curious because you commented earlier in reply to someone else that you had a code or affiliate link. Will let you know what my thoughts on it are after taking it. Robert, please do let me know what you think of Performance Lab’s Whole-Food Multi. All the feedback I’ve got on it so far has been 100% positive. 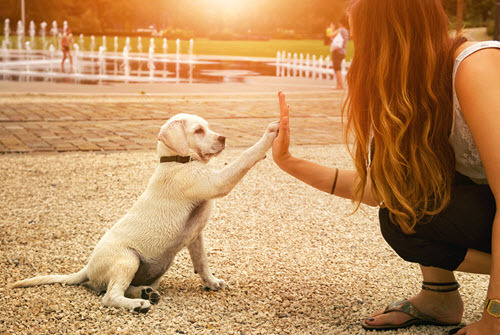 I am trying to find ways to feel and measure the difference in my life. This stack is fairly expensive, so I want to know ways with which I can decide if I am getting enough return on investment. How can I test?/measure? Sparsh, the easiest way to test the efficacy of this stack is how you feel after using it for a week or two. You’ll notice the difference in how you feel, the speed of your thinking and reaction time, and your mood. Some of these changes may be subtle. But one day something that would not have happened before. Life remembering some little thing. Or not reacting to something that would normally irritate you. BTW, please be careful on your “fish oil” supplement. I recommend finding a high quality Omega-3 high in DHA which is what your brain needs. Not plain old fish oil.